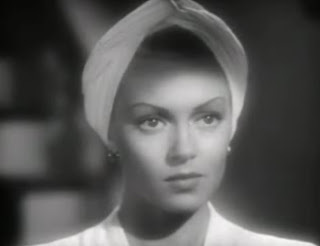 Although they were a popular item in the 1940s and can be convenient for disguising hair loss, I can't see that particular style of turban making a major mainstream comeback - partly because they have that "just got out of the shower and rolled a towel around my head" look, despite the fact that Lana Turner does look pretty attractive in the still photo above. Of course there are turbans and there are turbans - those brightly coloured, interestingly knotted turbans many African women wear look sensational and on the right head, anything can look good. Plus, just a simple silk scarf can look very spiff tied in a turban style. 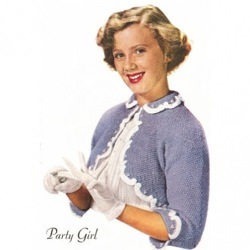 Turbans for women were nothing new and they were frequently worn by European women in the 1700s. However, 20th century fashion turbans on Western women were inspired by far-way places like Africa and the Middle-East and various versions were also relatively popular in the daring 1920s, when there was a particular penchant for the exotic. In the 40s, a relatively subdued Hollywood version of the turban, as seen on Lana above, was the predominant style, though there were many elaborations to this basic style...some wildly extravagant. 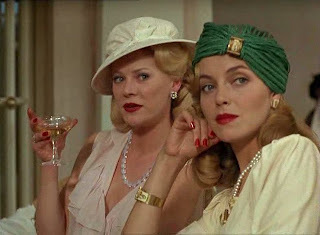 40s styles could range from a headband form with a turban knot, or a turban cap which covered the whole head (sometimes with a heavy, rolled fringe poking out) and more structured turban hats such as the green number with a gold clasp in the photo above right, worn by Greta Scacchi in the film White Mischief, set in 1940s colonial Africa. 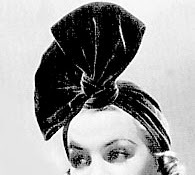 Singer and actress Carmen Miranda eccentrically piled a tower of fake fruit on her turban and it became her trademark. I suppose in the loosest sense, it's a style that never really dissappeared, since there are scores of women who wear some version of the turban in many different parts of the world. 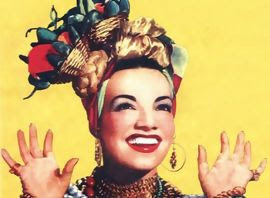 Carmen Miranda wearing her trademark fruit.